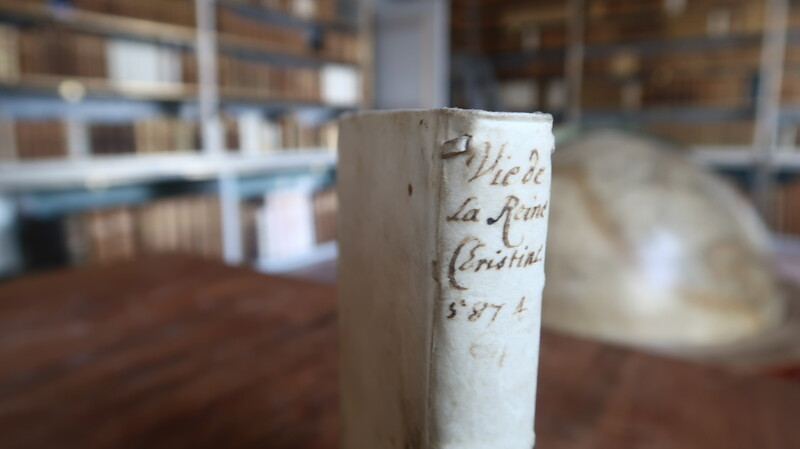 There is a rather curious little book on the history of queen Christiana in the Leufsta Library that has a handwritten marking ‘Constanter’ on the title-page. This is the motto of the Dutch poet, diplomat and scholar Constantijn Huygens (1596-1687) . A second annotation on the title-page holds the clue to how this book ended up in Sweden. The Constanter provenance is arguably one of the classics in Dutch book science. Many colleagues will recognize it instantly, mostly thanks to the missionary work of a group of Huygens researchers and enthusiasts. Dr. Ad Leerintveld, formerly of the National Library of the Netherlands in The Hague, described the first set of Constanters in two articles (1998 and 2009), on which others have built. A website shows the slowly growing list of copies from Huygens’ library. So far, over two hundred copies with the Constanter provenance have been identified. The copy containing the history of the Swedish queen Christina – who created quite a scandal when she abdicated her throne and converted to Roman Catholicism in 1654 – is the latest addition to the list. The library of Constantijn Huygens comprised approximately 8,000 books. When Huygens died, one part of the collection was sold at an auction in 1688, another part of the library was divided among his sons Christiaan and Constantijn Jr., and subsequently sold at auctions in 1695 and 1701. There are examples, however, of copies that bear the Constanter mark but are not mentioned in any of the auctions. The books have since spread out over Europe and later the rest of the world. Tracing the Constanter copies can learn us much about acquisition, book ownership and the build up of a library in the seventeenth century. Also, it may provide new insights in the buyers at auctions and the dissemination of ‘second-hand’ books over Europe. We do not know exactly where Huygens acquired the book, but it certainly was not in Stockholm in 1677. The imprint on the title-page is false, Jean Pleyn de Courage is a literary figure that appeared in some satirical pamphlets from the 1670s, and not a printer or bookseller in Sweden. It is likely that the book was printed in the Netherlands, typographical features also point in that direction. It is most likely that Huygens bought the book himself in The Hague in the year of publication. Huygens had a history with queen Christina. In 1647 he had presented a copy of his Pathodia sacra et profana to the Swedish queen, but never got a response. 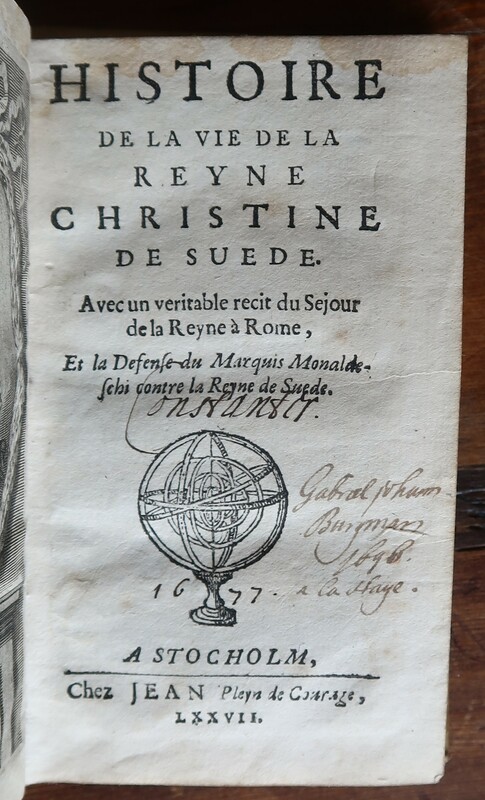 This copy of the anonymous Histoire de la vie de la reyne Christine de Suede does not appear in the auction catalogue of 1688, but is found in the catalogue of his son Christiaan Huygens in 1695, under libri miscellanei duodecimo, number 321. The second annotation on the title-page reads Gabriel Johan Burgman, which is probably statesman Gabriel Johannes Borgman (1656-1736), after his ennoblement known as Gabriel Hjelmborg. He acquired the book in The Hague in 1696, one year after the auction, which probably means that he bought it at a bookseller. Borgman died shortly before the young Charles De Geer moved to Sweden, so the book probably came to Leufsta through one of the children of Borgman. More research is obviously needed. Studying the handwritten acquisition catalogues of Leufsta library might give an answer to when exactly this book was received by Charles De Geer. On the spine of the book are two manuscript numbers, 5874 and (faint) 64, that have not yet been identified. Any updates will be posted on this website. In the meantime, be sure to check your local library for more Constanters. There are still a hypothetical 7,800 copies that have not yet been found. Additions to the list are much appreciated! Parchment binding with numbers 5874 and 64 on the spine. Ad Leerintveld, ”Magnificent paper’: the library of Constantijn Huygens’, in: Quaerendo, vol 28:3 (1998), pp. 165-184. Ad Leerintveld, ”Ex libris: ‘Constanter’. Boeken uit de bibiotheek van Constantijn Huygens’, in: Jaarboek voor Nederlandse boekgeschiedenis, 16 (2009), pp. 151-176.